This is why our campaigning journalism is important. Campaigning journalism from openDemocracy has pushed the UK government to change the law in Northern Ireland over anonymous political donations.On Monday the Northern Ireland secretary James Brokenshire announced the government would end the right of donors to Northern Ireland's political parties to remain anonymous. This issue came to prominence after openDemocracy exposed that the DUP received a £435,000 donation for its Brexit campaign that was hidden from public view. We exposed the shadowy links of the donor group that gave DUP that 'dark money' during the Brexit campaign. We raised the issue with the Electoral Commission. We asked the DUP's campaign manager about the money and its shadowy links, he claimed not to know. We investigated the senior Scottish Tory at the centre of this Brexit funding scandal. We showed how similar 'dark money' donations had helped the Scottish Tories too. And that one branding agency in a small town was oddly at the centre of several different Leave campaigns. 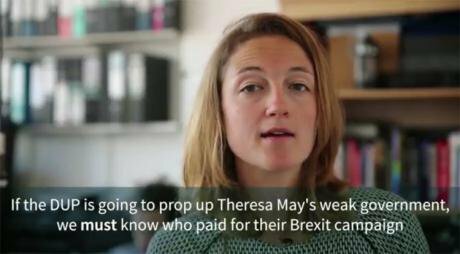 Our campaigning journalism and the interest it has attracted has played a key role in pressuring the government to change its tune on political donations. But it isn't enough. The new rules will not apply retroactively, and therefore won't expose where the DUP got their money from. And they won't stop secret donors using the other loophoes we've uncovered – which, for example, have allowed the Tories to flood Scotland with dark money. Nor will it stop politicians from doing the completely outrageous things we've exposed that are still 'within the rules'. We aren't going to drop this. But we need your help to keep digging. We're crowd-funding our investigation because we think everyone deserves to know who bankrolls our politics.